Sorry everybody, but I'm too swamped with work to post again today this week. I'll try to resume my regular schedule tomorrow next week. In the meantime, feel free to click around on my blogrolls. There's a lot o' good stuff there! It seems unfair that it's Monday already, especially since I'm booked into a solid block of meetings from 11:00 a.m. to 3:00 p.m. today (so far). I guess that's what happens when you ask for more work to do! From Friday afternoon to Sunday afternoon, all my time was taken up with my community service organization's regional conference. I was in charge of the hospitality suite at the hotel, so I expended a lot of effort getting soft drinks, beer and wine hauled into place and iced down. I used the sink as a cooler for the sodas and the bathtub as a cooler for the beer and bottled water. I made many trips down the hall to the ice machine to get loads of ice. Empty, clean kitty litter buckets make great ice-fetching pails! Our hospitality suite was across the hall from a similar suite occupied by a group of Shriners. I don't think anyone staying on that floor got much sleep on Saturday evening. On Sunday, the club needed to borrow my sound system for a singing group, so my husband and I loaded four big speakers (each weighing more than 50 pounds), an amp, a mixing board and a heavy bag full of cables into the Jeep during a thunderstorm at about 12:30 a.m. I slept for less than five hours, then drove to the hotel, unloaded the gear (with the help of a bellman, who got a $10 tip for his trouble), set it up, sat through the program, broke it back down and reloaded it into the Jeep by myself. I helped break down the hospitality suite and load the leftover beer, wine and soda into another member's car and was home and unloading the Jeep (again, by myself) by about 11:00 a.m.
My husband was still asleep when I returned, so I took his Jeep to get an oil change. He's not very consistent about vehicle maintenance, so I try to do a few things to spruce up his car whenever I get my hands on it. I also filled it with gas, which cost more than $60. Aaaagh! That's a month's worth of gas for my car. After a long wait at Jiffy Lube, during which I chatted up a fellow customer who is now a "friend" on my band's MySpace page, I took the Jeep home, had a quick lunch with the hubby and still made it to band practice by 2:00 p.m. Practice ended around 6:00 p.m. After we put our gear away, I left and found a store that was still open, bought my niece two CDs for her sixth birthday (Kelly Clarkson and Evanescence) and drove about 25 minutes to give them to her. I was rewarded with a big piece of her birthday cake, a pint of Guinness and the chance to watch "The Sopranos" on their high-def TV (with my niece in another part of the house, in case you're wondering). I made it home by 9:30 p.m., gave my husband a Lacuna Coil CD as a late birthday gift, did a little laundry and got to bed by 10:30 p.m. If I can keep up that kind of efficiency all week long, I'll be a model employee. I'd better ice down some Red Bull to tilt the odds in my favor. I sort of took the day off today. It's the first day of a 3-day conference for my community service organization, so I figured I'd take a volunteer day. Unfortunately, I ended up having two meetings scheduled later this morning, so my "day off" really starts around 11:00 a.m. Right now I'm in a car dealer's waiting room while the oil is being changed in my car. I love that they offer high-speed Internet access here, but I can't do all the surfing I'd like because their filter excludes some of my favorite blogs. Once I've made it through my meetings, I need to go buy some beer for the hospitality suite at the conference, choose some sort of acceptable outfit for tonight's dinner, and head to the hotel to help with setup. I'm tired already just thinking about it (although a lot of that may have to do with the fact that I haven't had any caffeine yet). Last night my husband and I went to our gym after dinner and worked out for about 45 minutes. It's too soon for the sore muscles to kick in, but I predict that I'll be stiffening up in the late afternoon. It felt good to work out, though. I did a cumulative 20 minutes of aerobics and some upper body weight training. If I could work in 45 minutes of exercise every day, maybe I wouldn't have to fear short-sleeve season so much. That's pretty much all I have going on (I'd say it's quite enough!). Are your weekend plans more fun than mine? Why am I up at 5:30 a.m.? My own sneezing woke me up. As much as I'm enjoying sleeping with the windows open, I think there must be an evil, new pollen coming in as of this morning. It's partly my own fault. I've been remarkably allergy symptom-free since I started using a neti pot a few weeks ago, but I haven't been very consistent about using it over the last few days. A little more discipline about that for the rest of the spring should help a great deal. Allergies aren't the only thing about spring that's bugging me. I'm having severe wardrobe issues as well. I spent the entire winter wearing long-sleeved t-shirts with regular t-shirts layered over them. Now that it's too warm for that, I'm faced with exposing my pale, flabby upper arms. Seriously, nobody wants to see that. I suppose it would help if I spent some time working out. Maybe if I had just a teensy bit of muscle definition here and there, I wouldn't feel so strongly about keeping every square inch of my arms and legs covered. I'll just add "Actually use gym membership" as #856 on my to-do list. It's as good as done! I'm happy to be able to say that my tax situation worked out in my favor this year, for once. I called my accountant on Monday and she told me that we were getting refunds from federal, the state where we live, and the state where I work. Also, she offered to fax us some paperwork that we could sign and fax back to her, saving me a 40+ minute round trip and allowing her to eFile our taxes for us. Woohoo! The refunds are a mixed blessing. As our accountant pointed out, we're mainly getting them because our adjusted gross income was significantly lower last year than in previous years. They also mean that we've been letting the government sit on too much of our money all year long, but it's such a delicate balance that I'm inclined to leave our exemptions as they are. It also helped that neither one of us was self-employed last year. That whole quarterly estimated tax payment thing always eludes us both. I wish I could say we're going to take the "windfall" and do something fun with it. Unfortunately, just off the top of my head I can think of bills that add up more than the federal refund. Thus, our gift to ourselves will be 'momentary freedom from overdue payments.' Yay! How'd Uncle Sam treat you this year? I've been spending more time in the kitchen lately, and I've noticed that certain items that I should have in ample supply seem to have just vanished. My grandmother (jokingly, I presume) always said it was gremlins. The sock gremlin is the most common. That's why every sock drawer eventually ends up with so many single socks. I always thought that sounded more like a washing machine problem, though. My gremlins are particularly fond of chip clips. I know I should have at least a half-dozen of them, but there are none to be found. It's not that they're all used up - there are no sealed bags of chips in the cupboard either. You'd think I'd at least have a clothespin in the chip clip drawer, but they're all gone, too. It's very suspicious. Many of the things in the house that frequently disappear can be blamed on the remote control hungry La-Z-Boy couch, or the tilted shelves in the bathroom cabinet that neatly tip toiletries into the bathroom trash can where they're immediately consumed by tissues, never to be seen again. Then there's my ponytail holder gremlin, a.k.a. my cat, Velcro. I can't leave a ponytail holder on any surface that she can reach or she'll grab it in her teeth, bat it around on the floor, and eventually lose it under a big piece of furniture or down a vent. What kinds of things do your household gremlins go after? Have you ever solved one of your gremlin mysteries or are they all inexplicable? First of all, I want to say "Happy Birthday, Honey!" to my husband. I don't think he actually reads this much anymore, but the sentiment remains the same either way. He's having the world's lamest birthday celebration so far. Yesterday we went out to dinner at Red Robin (his choice) and then returned home and watched hours of TV. We'd thought about going to a movie, but none of the selections looked particularly appealing. Tonight he has band practice, so I'm going to bring over a cake at some point. First I need to go retrieve our tax forms from the accountant, though. As long as I'm interrupting practice, I figure I might as well have my husband sign the forms so I can go sit in the queue outside the post office this evening. I don't know why I'm so determined to get our taxes sent off today. I've been friends with enough IRS employees over the years to know that there's a secret grace period. Even so, I can't bear the idea of deliberately mailing them late. That's how my day stacks up so far. I think I'll go downstairs and make a sandwich for lunch out of leftover Easter ham, then head off to work. Happy Tax Day to everyone in the U.S. and Happy Monday to everyone else! I'm kind of over the whole childhood photos thing already. I meant to take it through today, but I couldn't find some of the photos I'd meant to include. Oh well, the comments were dwindling anyway. What have I been doing this week while distracting you with my trip down memory lane? On Tuesday, The Cowboy came over and brought a big box of silicone bakeware for us to play with. We made almond poppyseed bread, mini angelfood cakes, blueberry-filled muffins and pound cake before tiring of the whole enterprise at midnight. I made him take home a big Tupperware container full of baked goods and I dumped the rest of it in the breakroom at work the next day. I think I tried less than one slice of each thing we made. I finally called my accountant to see when my taxes might be ready to pick up. The answer: tomorrow. Which means if we owe any money to the government, we have one weekend day to come up with it. Keep your fingers crossed for me. Earlier this week, I went into the dentist for two fillings. One of them was to replace the back portion of one of my lower back teeth that had broken off. When the dentist told me that I had a broken tooth, I said that I guessed I'd have to stop opening beer bottles with my teeth. He laughed. I'd been noticing for a while that after every meal, that side of my jaw would ache for hours. Ever since my dentist fixed the tooth, that hasn't been happening. Yay! That's about it for this week. It's no more interesting than the other stuff, I'm sure, but what are you gonna do? Here's a photo of me in full-on spoiled brat mode. 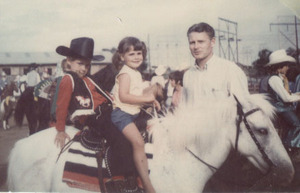 My parents had arranged for me to ride around the ring at a rodeo on my pony, Twilight. Clearly, the Rodeo Queen did not appreciate sharing her photo op with her little sister. Twilight was my second pony - the first was a tiny, red Shetland named Twirlsy (can you tell I named her myself?). Twirlsy once bucked me off in our pasture and then stepped on me as she walked away, but she was so small that it didn't really hurt. I think the event in the photo marked the beginning and end of my rodeo career. I'm still comfortable riding a horse, but I was never expert at it. After I outgrew Twilight, my parents gave me the option of getting a horse or getting to go on a school trip to Washington D.C. I chose the trip. It was probably the right choice. I'll never pass up a chance to go horseback riding, but I doubt I'd ever put in the effort to own and care for my own horse again. By the way, the photo above is also part of the Vintage Kids as Cowpokes pool on Flickr. I ran across the group a few months back via a link on another blog and I'd been meaning to find this photo and add it ever since. Click and see other wee cowboys and cowgirls over the past century or so. I don't know how old I was when I wrote this letter to the Tooth Fairy asking her to draw a picture of herself, but it's been folded up in my baby book ever since. Why is the paper all crinkly? Well, it's because it's written on a Kleenex. 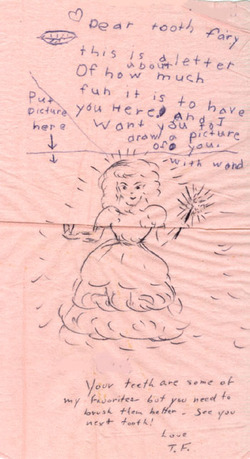 I though it was very accommodating of the Tooth Fairy to take the time to draw the picture (with wand!) and still leave me a quarter or whatever the going rate for teeth was at the time. She couldn't resist hassling me about my dental hygiene, but I suppose you can't blame her.